So…dates were not perfect for May. I have realized that May is in actuality busier than December, which had previously in my estimation been the busiest month of the year. I was wrong. It is May. In May you have all of your end of year stuff. Orchestra Concert. Dance Recital (which means extra rehearsal). Piano recital. School programs. Awards assemblies. Class parties. Add do that for us an overlap in soccer and baseball/softball season. We also have a birthday in May and did a friend party this year. And Kaitlyn was baptized in May. All in all, it was a busy month and we usually had at least two things going on every night. Nate had Brayden and Kaitlyn, and that was not a great combo for May. Nate is obviously not home as much as I am since he works. Brayden and Kaitlyn are our two busiest children at this point. So he didn’t get either of them done, but plans to do them in June (so he gets to do all four!). I had McKenna and Brinley and I was able to get them done. For McKenna (age 6), I needed to do something low key. Everything she has done this year has been big–going to a gymnastics meet, going rock climbing, going to the ballet, going rock climbing…so she and I decided we would go get ice cream and go shoe shopping. I seem to go shopping with my children a lot for dates, and I don’t even particularly like shopping! I am not a woman who is into shopping. But it is a situation where we are going out for a treat and the child needs something, like church shoes, so we end up shoe shopping. So far, no one has complained. For Brinley, my desire was to go to the zoo with her (just a small local zoo). But it rained all month! Seriously. Any day we could go, it was raining (and it was raining almost every day of the month). So in the end we went out and went to some of her favorite stores (again with the shopping) but we did it at a toddler pace. I let her walk and there was no rushing her along. We spent hours. She seriously loved it. We also got a “treat” but for her treat she wanted an apple. So we went to the grocery store and I let her pick out a bunch of apples to take home. She enjoyed it. We did do a fun family date this month that is not something we have ever done as a group before. 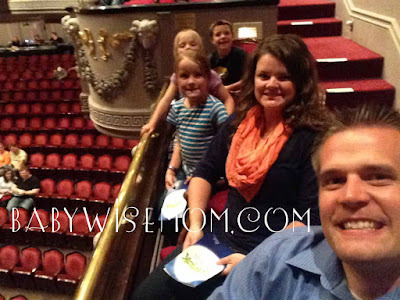 We went to a musical–Shrek. We all really enjoyed it. I had only ever taken Kaitlyn to musicals, but I thought this would be a fun one that everyone would enjoy and they definitely did!